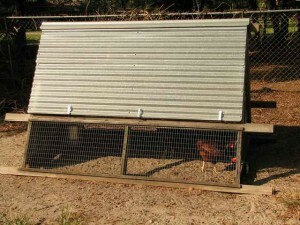 This was one of my earlier chicken coop projects and was begun in March 2007. 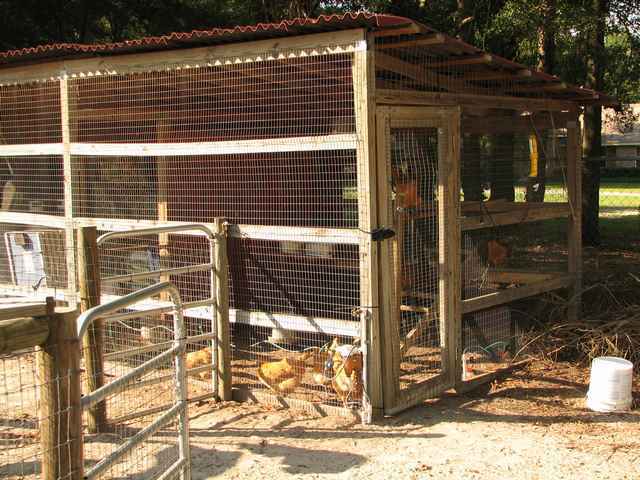 All chickens had previously been in a large walk-in coop built in about 1998. The objective was to build a chicken ark (also known as a “chicken tractor” but I have a hard time calling something like this a “tractor”). I learned a lot. Some ideas worked and some didn’t. What follows is a series of photos. It is not a set of detailed how-to instructions, but rather construction techniques that may make your own project easier. I started with only a very rough sketch and pretty much designed it as I went. This was my first – and last – coop using this basic design. For the amount of work and materials that went into it, it really isn’t a very efficient use of space. The general construction method of building side panels from 2x2s, Simpson Strong-Tie braces, and corrugated sheet metal worked very well. It turned out to be too heavy to move easily. The same thing applies to most of my other designs though. Portability is a relative term. This design used galvanized Phillips head deck screws. I have since switched over to square drive stainless steel screws. They work much better for this application and are not that much more in cost. Even though it rests directly on the ground, I have never had any predator dig under it. Perhaps I’ve just been lucky. I have decided that the roof vents are not worth the effort. 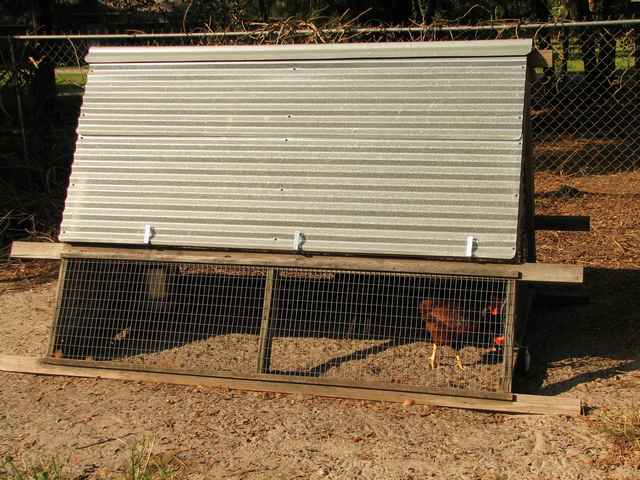 In hot weather, the chickens stay on the ground anyway, and at night when they are up on the roost, it’s still cool enough. The dimensions make the best use of standard material size. The idea was that I would be able to lift the ark by the ridge piece, but it is not strong enough to hold that weight comfortably. 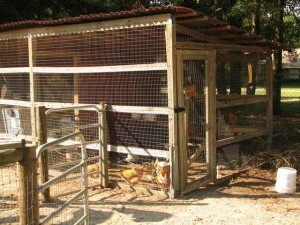 Original chicken coop, built in about 1998.